"His wisdom exceeds his time." The Maui Weekly honors the late “Uncle” Ed Lindsey for his many years of dedicated service to Maui. These words could have been spoken by our Person of the Year for 2009. For his lifetime of hard work communicating a model of preservation of the Hawaiian culture, education and sustainability; for protecting the lands and sea of Maui, Edwin “Ed” Robert Naleilehua Lindsey Jr., is our nominee. Uncle Ed, as many called him, was born in Lahaina in 1939, and was an alumni of Kamehameha Schools. During his stint in the U.S. Air Force, he met his wife-to-be, Puanani Doong of Wailuku, and together they shared a lifelong devotion to each other and to Maui. Photo: Sean Lester Uncle Ed shared his music with people for decades. 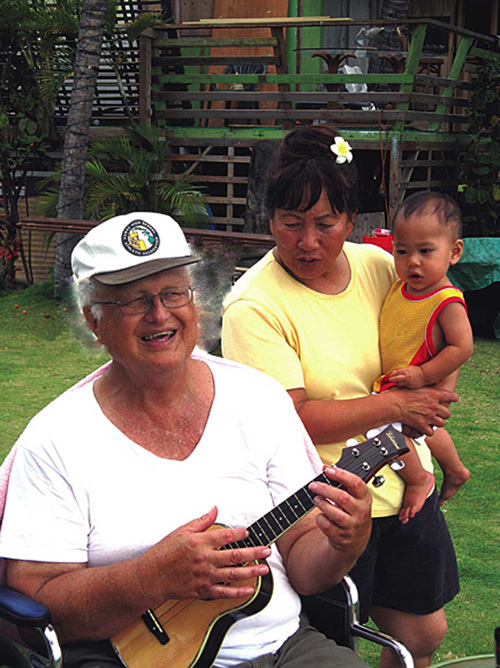 He always enjoyed a little ‘ukelele time with his wife, Puanani, and grandson, Keolewa, at their Lahaina family home. Realizing his passion for educating, Ed earned teaching credentials at Western State University in Colorado. As a teacher, Ed was assigned to Hāna then ‘Īao Intermediate School in Wailuku, where he retired after 25 years. During his formative years, the influence of his parents, Rose “Pua” and Ned Lindsey, both activists and visionaries who worked to preserve Hawaiian culture and lands, sharpened Ed’s focus on waking the ancient powers that shaped the Valley Isle. Today, months after his passing, people speak of how his message continues to guide them. Ed’s ethic is reflected in son Ekolu Lindsey, now president of Maui Cultural Lands (MCL), a nonprofit Maui-based land trust organization Ed founded. Its mission is to stabilize, protect and restore Hawaiian cultural resources. Ekolu said MCL especially focuses on educating children about Hawaiian ecology and archeological preservation. “But most importantly, [we teach them] how to behave in society—to do the right thing,” Ekolu added. A pragmatist and a pioneer of island sustainability, Ed always tried to enable the host culture to have a voice in a changing Maui landscape. 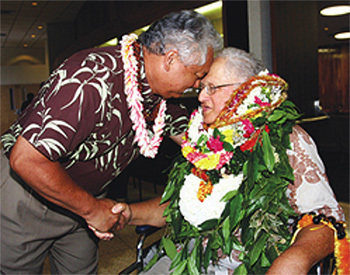 On May 15, 2009, the Maui County Council unanimously passed a resolution honoring Ed as E ‘opu ali’i—having the heart of a chief—and as a Maui Treasure. The truth of these words were evident in the heartfelt applause of over 100 people. On June 24, 2009, at age 70, Uncle Ed Lindsey passed away peacefully at the family home in Lahaina in the presence of his beloved Puanani. To honor the memory of Uncle Ed, volunteer or donate to Maui Cultural Lands. Visit www.mauiculturallands.org for more information. Copyright © 2007 The Maui Weekly.